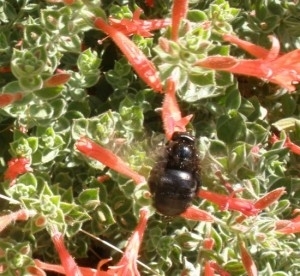 It's understandable to question what the hubbub is all about then water-wise plants are compared side-by-side with traditional landscape species. Negative reactions tend to fall into one of two categories: 1) “they look different from my thirsty plants, and are therefore ugly”, or 2)” if I search long enough, I will find species looking exactly like the thirsty ones I have now.” Although experience will always affect how we see the world, let us attempt to remove our Hydrangea-tinted glasses for a less biased viewpoint by exploring what makes water-wise plants look the way they do. One of the first things we notice is how sparse water-wise plants look when compared to the lush, full growth of thirstier plants. It's all about water conservation, as smaller and fewer leaves mean less surface area for water to escape from and less to keep cool in the hot sun. While these acclimated plants can appear strange or unappealing at first, contemplating the paradox of growing lush plants with giant foliage in a hot, dry climate, renders those traditional plants a little more bizarre than before. Another trait shared by many water-wise plants is fuzzy foliage, which is due to hairs on the leaf surface that protect against excess UV radiation. Plants with smooth, bluish-green foliage have a thick, waxy cuticle that also protects against UV radiation, along with reducing water loss. The soft, supple, bright green foliage found on plants native to regions with summer rain is rare among drought-tolerant plants. California plants native to riparian areas where rivers and streams provide roots with year-round access to water are an exception. Winter dormancy certainly isn't unique to our climate, but the extreme heat of summer means some plants shed leaves in late summer to reduce water loss. This can be in lieu of, or in addition to, a winter dormancy. 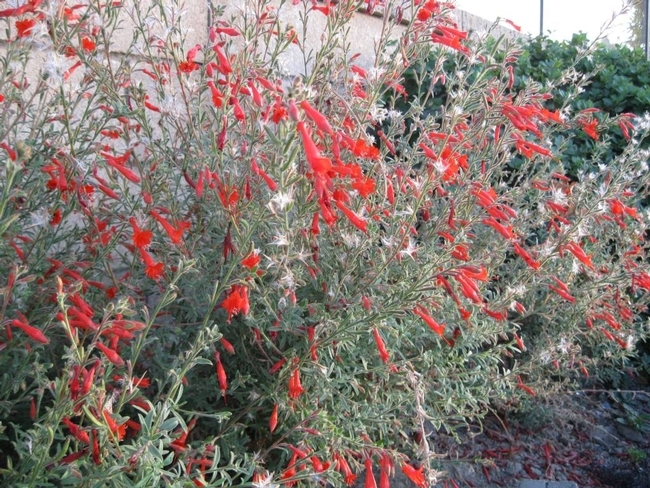 Summer shabbiness is difficult to stomach, but there are some drought-tolerant plants that naturally bloom in late summer. California fuchsias and Buckwheats (Eriogonum species) are two prime examples, sending up plenty of beautiful, pollinator-feeding flowers at this difficult time of year, but without requiring excess irrigation. Visiting a nursery and comparing drought-tolerant plants with the eye-popping pony-packs of Snapdragons and Petunias can be a tad disappointing. Keep in mind that low-water plants are at their best when their roots have room to spread, which can't happen in a little one-gallon container. Starting small and, I admit, a little scraggly at times, they have great potential for maturing into graceful specimens, providing benefits to pollinators and other wildlife, while asking for less water, maintenance, and fertilizer in return. If you still find yourself unconvinced, a field trip to a water-wise demonstration garden featuring water-wise plants could provide a more realistic view of what these plants will look like as they mature. The SJ County Master Gardeners have a demo garden by the Stockton airport at 2102 E. Earhart Avenue. For more water-wise demo garden locations, or if you have a gardening related question, you can contact the UC Master Gardeners at 209-953-6112. More information can be found on our website at sjmastergardeners.ucanr.edu.